Evan Lysacek on His "DWTS" Cast Mates: "[Buzz Aldrin] Could Probably Bench-Press Me"
Evan Lysacek is in a three-way race for gold in figure skating. Evan Lysacek may be an Olympic gold medal winner in the skating rink, but the new "Dancing with the Stars" contestant is staying humble about his chances in the world of reality TV. When Access Hollywood's Billy Bush told Evan in an interview for Access and "The Billy Bush Show" that he had beaten out Pussycat Dolls singer Nicole Scherzinger in Access' AH Nation poll for the star most likely to win "Dancing," Evan was taken aback. "Nicole Scherzinger is the most incredible dancer I've ever seen," he said. "I have her music videos on my iTunes and I watch them repeatedly." In addition, Evan said people would be surprised by some of the other "Stars" set to heat up the ballroom. "[Kate Gosselin's] really graceful, people are going to be blown away," he said, adding that viewers should watch out for former astronaut Buzz Aldrin, as well. "This dude, for an 80-year-old – he could probably bench-press me if he wanted to." While Evan's Olympic outfits were all made by his friend and prominent designer Vera Wang, he'll have to adjust to the "Dancing" costume department's threads for the show. "They have a great wardrobe department at the show," he said, adding that he'll be able to add his own two cents to his outfits. "The celebs and the pro dancers have a lot of input on what they want to wear. I'm going to try but my partner [Anna Trebunskaya] has already said, 'There are certain dances where you can't wear black.'" As for his hairstyle? Unlike his skating look, he may go product-free. "I think for me when I'm on the ice skating, I've become used to having my hair slicked back, but on the dance floor? We'll have to see," Evan said. On Tuesday night, Evan stepped out at the opening of Vera's new Melrose Ave. store in LA, where he told Billy he'd headed straight from Vancouver – and his medal win – to start training with Anna. "I think people will be surprised to know I've never had dance training," he told Billy. "There are challenges I wasn't expecting — everything rotates on the floor clockwise and on the ice, we rotate everything counterclockwise. [But] my partner's great and she's so patient with me and she's a drill sergeant which is what I respond best to." "But kind of crazy coming from an Olympic champion only two weeks old!" Vera herself added. "Dancing with the Stars" premieres on ABC on March 22. PLAY IT NOW: 'Dancing With The Stars' Season 10 Cast Revealed! 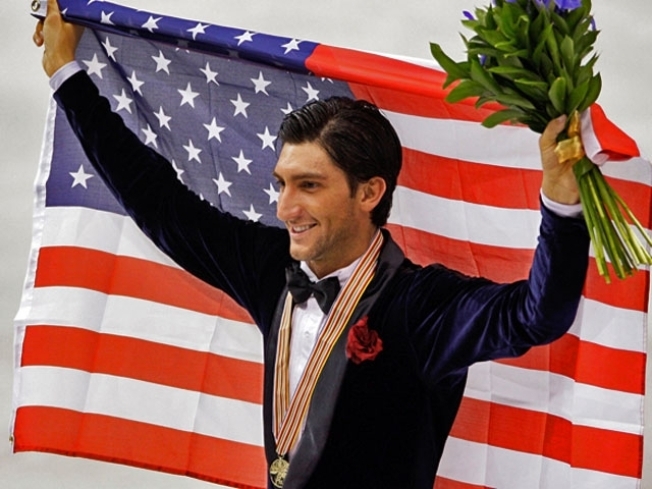 PLAY IT NOW: 2010 Winter Olympics: Will Evan Lysacek Bring Home Gold?